Hannah Breckbill told 150 people at the Decorah Elks Club last week about her hopes and dreams for the organic vegetable farm she owns with Emily Fagan north of Decorah, Humble Hands Harvest. She walked away with dozens of offers to fund new fruit trees and to help with labor on the farm. An artist piped up asking to paint the women a mural on their shed. Another in the audience said she’d lend an augur to plant the trees. It was all part of the first Winneshiek Idea House local entrepreneur forum Saturday. The forum was modeled after a similar event held in Totnes, U.K., for the past six years. Entrepreneurs who operate or are planning ethical, sustainable and local businesses are invited to present their ideas to an audience of potential investors. It’s a community-based version of the television show “Shark Tank,” but with the abundant fly-fishing near Decorah, the name had to be Trout Tank. After listening to the entrepreneurial pitches, the investors asked clarifying questions and then offered help to the presenters. In this case, investors are defined as anybody who is willing to support friends and neighbors who are starting a socially minded business or taking their existing enterprises to the next level. An investment can be almost anything—use of a space or equipment, expertise, labor, general enthusiasm and moral support and advertising. Financial donations, of course, are welcome, as are patient loans—long-term loans with no or low interest. In the Trout Tank, investors called out their offers or wrote them down and handed them in that night. “Think of it as crowd funding in real time,” said Idea House co-organizer Tabita Green, an entrepreneur and community organizer in Decorah. 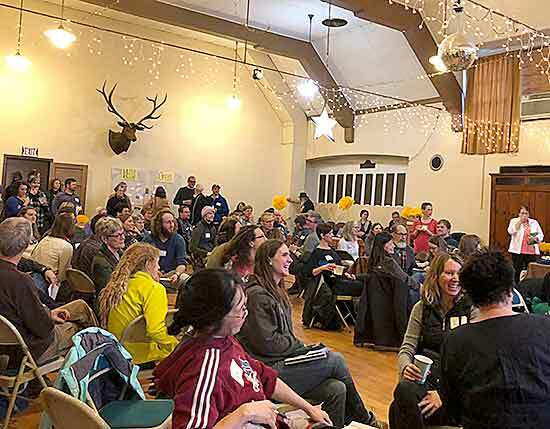 Last summer, Green and Liz Rog, of decorahnow.com, met the organizer of the Totnes forum at a national gathering of Transition US, which promotes a vision of resilient, local, connected and fossil-fuel-free communities. They learned that the U.K. community has launched more than 20 local sustainable businesses through its entrepreneur forums and were inspired to try the idea in Winneshiek County. Back in Decorah, Green and Rog talked up the entrepreneur forum idea and three more Decorah women joined the planning committee: Winneshiek Energy District community outreach coordinator Kristin Eggen, Lingonberry event venue proprietor Ellen Rockne, and Stephanie Fromm, executive director of Winneshiek County Development, Inc (WCDI). They invited entrepreneurs throughout the county to submit their ideas and through an interview process narrowed the Trout Tank presenters to five. WCDI, partnering with Jay Wickham of the Iowa Small Business Development Centers, supplied the Trout Tank presenters with free coaching on developing and refining their business plans. Theatre professional Kristin Underwood helped presenters polish the presentation of their ideas. • Cody Whittle, who plans to create a line of apparel, Big Driftless, and an accompanying website to promote and celebrate the Driftless Area. Audience investors offered donations and loans, ideas on how to find space for some of the businesses, childcare, purchases of community sponsored agriculture (CSA) shares, online marketing assistance, photography, an industrial sewing machine, and more. Orth said even the handshakes and verbal support he received during the evening were helpful in his determination to move forward with his distillery. The forum’s first hour, before the Trout Tank began, gave 13 other entrepreneurs an opportunity to mine the community for advice as well. They presented their ideas and concerns in three small-group sessions. Among the participants was Tor Janson, who plans a farming operation in Calmar, called Driftless Traditions, to provide seeds, plants and trees, livestock and heritage poultry that celebrate the food traditions of the Upper Midwest. “It was a way to get local feedback from the sharp, experienced people,” he said. Janson got tips about other people he should talk with who might be supportive and help him find investors. “I was surprised at how much ground we covered and how focused and targeted the feedback was” during the short sessions, he said. Janson was also the featured speaker prior to the Trout Tank session. Driving his dream for Driftless Traditions is the concept of economic resilience. It used to be that area farmers would not only send their products to outside markets, but they would sell them locally, which can be an essential lifeline during bad economic times nationally, Janson said. “It’s really on us to take care of ourselves and re-establish the local feedback loops into our economy so we’ll be more resilient going forward,” he said. For more information about Winneshiek Idea House or to receive notices about future forums, email Tabita Green at tabita@newdigital.coop. Learn about the no-cost business advice and resources available to entrepreneurs through WCDI at winneshiekdevelopment.org. Sponsors of the Winneshiek Idea House entrepreneur forum include WCDI; Decorah Bank and Trust Co.; Black Hills Energy; Anundsen Publishing Co.; and Iowa Small Business Development Centers.